Japanese Beauty Products | Beauty. Skin Whitening. Health & Sexual Wellness. 4 Beauty supplements with a combination of the best anti-aging ingredients, collagen and placenta. Collagen peptide, placenta extract, golden rose fruit, U.S. extract, flower extract of the rose, shark cartilage extract, cellulose, sucrose ester, hyaluronic acid, fine grain silicon dioxide, Vitamin C, niacin, panthothenic acid Ca, Vitamin E, Vitamin B1, Vitamin B2, Vitamin B6, Vitamin A, Vitamin D, Vitamin B12, and folic acid. -can give you that glowing and youthful skin that you’ve always wanted! -Ultra-violet rays and stress take a toll on our bodies, making our skin appear more aged. -With this product from DHC, you can help return that youthful glow to your skin. -With a special combination of 5 carefully selected ingredients. -DHC’s Nameraka is ideal for those who are concerned about their skin and not only want to make their skin feel revitalized and refreshed but make their skin feel smoother. -3 tablets daily. We recommend you take 3 tablets after having eaten your evening meal. 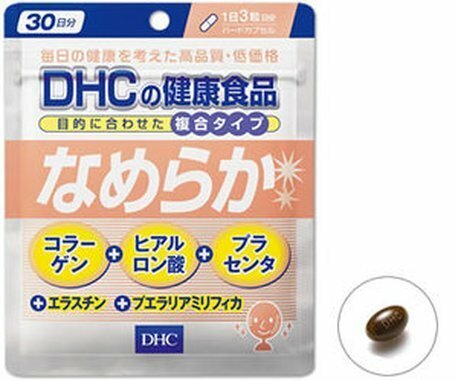 -DHC Esthe-mix, Concentrated Pueraria Mrifica, DHC Turn Life. -If you are currently using Soy Isovlavone, Red Clover extract, Pomegranate Seed extract or DHC. -Ganbuto Diet Supplement, please reduce the recommended daily dosage by approximately half. -If you are pregnant or have allergies to any of the listed ingredients, please avoid using this. – DHC Collagen Supplement contains Oceanic Fish Collagen, Vitamin B1, and Vitamin B2. – Take 5 tablets per day in 2 divided doses, before meals (empty stomach).